Background: The characterization of the dynamic process of veins walls is essential to understand venous functioning under normal and pathological conditions. However, little work has been done on dynamic venous properties. Aim: To characterize vein compliance (C), viscosity (η), peak-strain (WSt) and dissipated (WD) energy, damping (ξ), and their regional differences in order to evalúate their role in venous functioning during volume-pressure overloads. 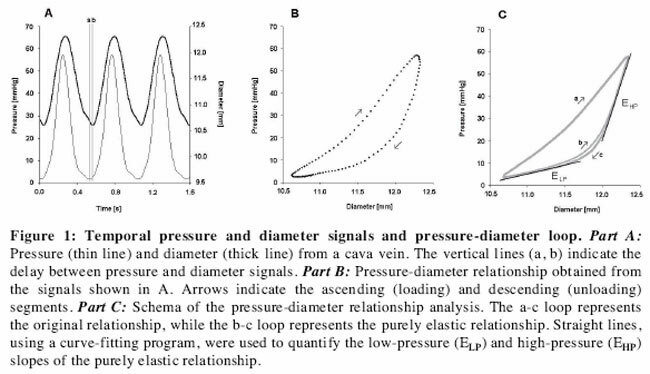 Methods: In a mock circulation, pressure (P) and diameter (D) of different veins (anterior cava, jugular and femoral; from 7 sheep), were registered during cyclical volume-pressure pulses. From the P-D relationship, C, WSt and ξ (at low and high P-D leveis), η and WD were calculated. Resulls: For each vein there were P-dependent differences in biomechanical, energetics, and damping capability. There were regional-differences in C, η), WSt and WD (p<0.05), but not in ξ. Conclusión: The regional-dependent differences in dynamics and energetics, and regional-similitude in damping could be important to ensure venous functioning during acute overloads. The lower C and higher WSt and WD found in back-limb veins (femoral), commonly submitted to high volume-pressure loads (i.e. during walking), could be considered relevant to ensure adequate venous system functionality and venous wall protection simultaneously. Key terms: compliance, damping, energetic, vascular physiology, venous wall, viscosity. Although the venous system is considered a low pressure and púlsate system, it can suddenly become a high pressure and/or pulsatility system, in which veins support acute cyclical volume and/or pressure overloads. For example, when one is standing, 0.4-0.5 liters of blood is shifted out of the thorax into the veins of the legs, causing an abrupt increase in their pressure from approximately 2.67 to 13.33 kPa (20 to 100 mmHg), and during running, pulsatility in leg veins is around 8.00-10.67 kPa (60-80 mmHg) (Holtz, 1996). Under these conditions, compensatory mechanisms are triggered to ensure adequate venous return and to minimize venous overload (Holtz, 1996). Failure of compensatory mechanisms can lead to important haemostatic and/or venous wall alterations (Monos et al., 1995). Different characteristics of the venous system (i-e. venous valves, reflex vasoconstriction) have been related to the venous behavior during haemodynamic changes. Frequency dependent biomechanical properties (i.e. wall viscosity) can determine the venous response to acute haemodynamic overloads. However, dynamic vein wall properties and their potential role during pressure or volume overloads remain unknown (Bradley and Davis, 2003). Haemodynamic overloads could be deleterious, since púlsate and/or abrupt vessel stretch causes high-frequency mechanical vibrations or oscillations that could damage the vascular wall (Armentano et al., 2006). To reduce the vibrations, some structures are capable of damping (converting mechanical into thermal energy), which depends on the ratio between peak-strain energy and dissipated energy; which in turn is determined by the dynamic (visco-elastic) properties of the structure. We recently proposed a new approach to interpret the physiological role of arterial damping (Armentano et al., 2006), but venous damping capability remains unknown. The structural diversity of veins could determine mechanical differences; therefore in order to characterize the dynamics of the venous it is necessary to analyse veins from difierent regions (Monos et al., 1995). The aim of this research was to characterize visco-elastic properties, energetics and vein damping, and to evalúate their regional differences. We performed dynamic (rather than static) mechanical analysis, and studied venous segments (rather than the commonly used strips or rings) (Silver et al., 2003), to reproduce in vivo haemodynamic conditions, to preserve the shape and integrity of venous wall and quantify frequency-dependent biomechanical properties and not only static properties (Bia et al., 2005). The procedures were in accordance with the Guidelines for the Care and Use of Laboratory Animáis published by the U.S. National Research Council (National Academy Press, Washington, D.C. 1996). Seven adult sheep (body weight=25-35 kg) were anaesthetized (pentobarbital, 35 mgákg1 intravenously) and the ventilation was maintained with mechanical assistance (Dragger SIMV Polyred 201, Madrid, Spain). Segments (6 cm-length) of the anterior cava (ACV), jugular (JV) and femoral (FV) veins were dissected and marked. After the sacrifice of the animáis, the segments were excised, placed in Tyrode solution and sent for biomechanical testing. The segments were mounted (at in vivo length) in a mock circulation organ chamber, and immersed in and perfused with Tyrode solution (37°C, oxygenated, pH=7.4). The perfusión line consisted of polyethylene tubing in which Tyrode solution circulated, powered by a pneumatic pump (Jarvik 5, Kolff Medical Inc, Salt Lake City, Utah, USA). The mock circulation allowed for determining cyclical changes in vascular pressure (P) (Fig. 1A). Solid-state micro transducers (1200 Hz frequency response, Konigsberg Instruments, Inc, Pasadena, CA, USA) were used to measure P. Ultrasonic crystals (5MHz) were sutured to the vessels to measure external diameter (D). The transit time of the ultrasonic signal (1580 m/s) was converted into distance by means of a sonomicrometer (1000 Hz frequency response, Tritón Technology Inc. San Diego, CA, USA). The methodological approach has been used with in vivo and in vitro studies (Armentano et al., 2006; Bia et al., 2005; Zócalo et al., 2006). The segments were allowed to stabilize for 10 minutes, under a dynamic state of volume and pressure changes. The segments were then submitted to cyclic changes (frequency=1.8 Hz) in P, from 0 to 8.0 kPa (0 to 60 mmHg) (Fig. 1A). The P and D signáis were displayed in real time, and 20-30 consecutive cycles were sampled (sample frequency=200 Hz) and analyzed. where η is the viscous parameter. To characterize wall viscosity, the viscous term was subtracted from PTotal using the criterion of disappearance of the hysteresis loop (Bia et al., 2004). Increasing valúes of η were given by visually inspecting the reduction of the hysteresis área (Fig. 1C). The η valué needed to reach a minimum (preserving the loop's clockwise course) was considered the venous wall viscous parameter (Bia et al., 2004). Two elastic parameters were then calculated as the slope of the purely elastic P-D relationship, at low (ELP, below P-D break-point) and high (EHP, above P-D break-point) P-D levéis (Fig. 1C). The computed parameters were expressed as compliance (C) at low (CLP=1/ELP) and high (CHP=1/EHP) P-D levels. Valúes were expressed as mean±standard deviation (MV±SD). T tests were used to compare parameters calculated at low and high P-D levéis. Múltiple comparisons were performed using ANOVA followed by Bonferroni correction. A p<0.05 was considered significant. Physiological levéis of venous P were satisfactorily simulated (Table I, Fig. 1A). Maximal and minimal P showed no differences among groups, enabling isobaric comparisons. For each vein, WSt was lower at high P (p<0.05) (Table II). There were differences in C among veins. The ACV showed the highest C, both at low and high P-D levéis (p<0.05). Viscosity was higher in the peripheral segments, particularly in the FV than in the ACV (p<0.05) (Table II). For all veins, WSt was higher at high P-D levéis (Table III). When comparing veins, both, WSt and WD were higher in the FV (p<0.05). ξ was lower at high P-D levéis and did not show differences among the studied segments (Table III). This is the first work to characterize vein viscosity, energetics and damping, and the regional differences among veins during physiological conditions. The main findings were that veins showed regional differences in viscoelasticity and energetics, but that damping was similar. Our data evidenced the recognized non-linearity (P-dependence) of veins compliance (Freeman et al., 2002), also found in WSt. At low P, the P-D slope is low, meaning that a large change in D (or volume) comes with only a small P change. Consequently, compliance and púlsate área are high. At higher P, the P-D relationship slope is steeper, the venous compliance and púlsate área are lower and their relationship determines an increase in WSt (Tables II and III). The P-D relationship shape could represent a functional adaptation that allows veins to respond adequately to changes in load. During an acute volume load the initial high compliance would ensure adequate cardiac filling, with reduced right atrium pressures. On the other hand, the low-compliance phase prevenís vascular over-distension and the reduction in central P (i.e. extreme venous pooling during postural changes) (Freeman et al., 2002). Moreover, as was suggested, without the low-compliance portion of the P-D curve, the upright posture without hypotension would be impossible (Olsen et al., 2000). These veins characteristics enable the venous system to act as a "haemodynamic buffer", contributing to maintain adequate central P levéis, venous return and cardiac output (Monos et al., 1995, Freeman et al, 2002). When comparing veins from different regions, we found differences in compliance and WSt at both low and high P levéis (Table II). The ACV (the central vein) showed the highest compliance, while the FV was the stiffest vein (least compliance) and showed the highest WSt. These results agree with the regional differences recently found where veins were characterized under arterial haemodynamic conditions (Zócalo et al., 2006). It is noteworthy that regional differences in compliance and WSt could not only be ascribed to geometrical differences, but also, as our results suggest, to the intrinsic biomechanical properties of the veins. In this respect, the JV and ACV showed similar WSt, despite their differences in diameter (or cross-sectional área). The regional-differences in venous compliance and WSt could be important in haemodynamic control mechanisms. For example, an abrupt change from the supine to the orthostatic position promotes the movement of blood from central (i.e. thoracic) to peripheral (i.e. limbs) veins. This fluid shift reduces central blood volume and cardiac filling, and could determine a transient compromise in arterial blood pressure, representing cardiovascular stress (Olsen et al., 2000). However, if fluid shifts into the peripheral veins are minimized, due to the relative stiffness of the peripheral veins, cardiovascular disturbances can be reduced. Henee, the differences in compliance among veins would be important in determining cardiovascular disturbances as the result of posture changes. Energy dissipation due to viscous properties allows veins to resist deformation with a frequeney or velocity-dependent mechanism (Silver et al., 2003). Although viscous behavior of veins was identified a long time ago (Alexander, 1963; Anliker et al., 1971; Nippa et al., 1971), no works have quantified viscosity and/or evaluated its meaning in relation to the physiology of veins. In this work, we postúlate that this apparent "energetic disadvantage" (energy loss) could contribute to damping, during haemodynamic overloads (Armentano et al., 2006). Vein viscosity was higher in the peripheral segments (Table II). The differences in viscosity could not be determined by the experimental conditions, since they were the same for all the segments, but they could depend on the structural differences among the veins. The higher viscosity in the peripheral segments could be important in the response to acute overloads and in haemodynamic control. The slow D change in peripheral veins could reduce acute volume variations, and henee, the fall in the cardiac filling. Moreover, since this mechanism depends on the intrinsic properties of the vein wall, it could be a first response to avoid haemodynamic disturbances related to postural changes. Wall viscosity determines WD, so its contribution to veins physiology and wall protection should be analyzed in energetic terms. Up to now, veins were not considered as structures with a high capacity to dissipate energy during physiological conditions. However, this work evidenced that veins have a high-energy dissipation capability. This could be a functional advantage that allows the venous system to bear and respond adequately to acute overloads. During postural changes, veins work conditions are rapidly modified and WD could be important in preventing wall damage during load changes. Additionally, high WD in peripheral veins could determine a rapid attenuation of waves that travel towards the heart (i.e. during walking). The reduction of ξ at high P levéis (Table III) suggests that the passive venous capability to protect itself is reduced during volume and/or P overloads. In previous works, similar results were found when evaluating arteries submitted to passive acute volume and/or P overloads (Bia et al., 2004). But, it remains to be elucidated, if the veins' smooth muscle regulates the x, keeping the wall protected during haemodynamic overloads, as has been described with arteries (Armentano et al., 2006). Despite the regional differences in WSt and WD, there were no differences in veins ξ. Henee, to withstand dissimilar loads, veins have different biomechanical and energetic properties, but the x capability would be a constant in the venous system, as we proposed for arteries (Bia et al., 2005). (Table III). In this work the biomechanical behavior of different veins was evaluated, analyzing the instantaneous P-D relationship. The veins' dynamic biomechanical properties, energetics and damping were characterized and compared. We found regional differences in the biomechanical parameters and energetics, but damping was similar among veins. Considering our results, it could be a physiological mechanism that depend on veins wall dynamics and contributes to the veins' response to haemodynamic changes, keeping the wall protected against high-frequeney vibrations. Since the proposed mechanism would depend on the intrinsic properties of the venous wall, it could be considered a continuous regulator of the venous return and a first response to haemodynamic disturbances. This work was performed under a cooperation agreement between the Universidad de la República and the Universidad Favaloro, and was partially supported by PE.DE.CI.BA (Uruguay). The authors acknowledge the contribution of Elbio Agote. Corresponding Author: Prof. Daniel Bia Santana. Departamento de Fisiología. Facultad de Medicina. Universidad de la República. General Flores 2125. PC: 11800. Montevideo, Uruguay. Phone: (0598-2) 924-3414. Fax: (0598-2) 924-0395. E-mail: dbia@fmed.edu.uy. Received: July 31, 2006. Accepted: April 2, 2007.